If it would have been up to Joseph, he would have told people the Real Truth from the beginning. Christopher would have done the same. Although it was his desire, Joseph followed our counsel and never told the people the Real Truth during his tenure as our True Messenger. It was not his place nor the time to do so. This would be reserved for Christopher. If Joseph Smith was to have told the Real Truth, the LDS/Mormon religion would not be what it has become: the wealthiest church (per capita) in the entire world—a religious organization diametrically opposed to the teachings of Jesus upon which Christianity supposes its authority and control over the minds and hearts of many people in the world. It was Joseph Smith’s role to “not disclose his true identity” (an allegoric reference to not telling the Real Truth) and allow the people to stumble according to their free agency. The LDS/Mormon religion is the epitome of and the most original Americanized religion that came as a result of government-protected religious freedom. The early Americans to whom Joseph Smith first presented his message were a prideful and stubborn people (i.e., stiffnecked). The first 116 pages of Joseph’s words, words that were to become the Book of Lehi of the Book of Mormon, were purposefully “lost” because the people to whom Joseph first presented the information couldn’t accept the insignificance of religion, especially priesthood authority. “It is given unto many to know the mysteries of God; nevertheless they are laid under a strict command that they shall not impart only according to the portion of his word which he doth grant unto the children of men, according to the heed and diligence which they give unto him. Joseph Smith knew he would eventually become a martyr and be killed as a result of his close friends and acquaintances finding out that he wasn’t telling them the Real Truth. Many of Joseph’s close friends left him and spoke evil of him because of Joseph’s changing doctrines and truths that were incorporated into the church he was asked to allow to form. To give the world an actual semblance of how things transpired during Joseph’s life, regarding one of Joseph’s close supporters who would eventually become his most bitter enemy, we allowed Christopher to permit Harry Dschaak to be his friend and become closely involved in our work. We knew that one day Mr. Dschaak would become a hateful, bitter enemy. The mortal incarnate of Mr. Dschaak was John C. Bennett during Joseph Smith’s tenure. Christopher recognized this of Mr. Dschaak when Christopher first met him in the early part of 2005. Mr. Dschaak had the same problem with Christopher as many of Joseph’s original followers had with him, especially John C. Bennett. It was hard for them to accept the ever-changing ideology and truths that Joseph was revealing to the people. For a wise purpose in presenting an example of the above, we advised Christopher to sue Mr. Dschaak for defamation (libel). Christopher is in the process of losing his case against Mr. Dschaak. The prejudiced Idaho State District Judge (Robert C. Naftz) who is overseeing the case will award Mr. Dschaak a judgment for the emotional suffering Mr. Dschaak claims he experienced because of being involved with our work. Because of the judge’s behavior in this case and his blind eye to the law that prevents a person from being awarded damages outside the set parameters of the statute of limitations, we will consider our options for an appeal once the judge has issued his final judgment and order. During his final days, Joseph Smith was a continual fugitive from justice because of the same prejudice he received by judges of the same demeanor and predisposition of Judge Naftz. It is likely that Judge Naftz will issue an arrest warrant for Christopher because of Christopher’s refusal to answer court-ordered interrogatories as Christopher has outlined in his final brief filed in Judge Naftz’ court. We will not allow Christopher to be arrested, nor will we allow him to be subjected to the prejudice and abuse of Judge Naftz’ court. If we find it conducive to further the example set forth by the defamation case in showing similarities to Joseph Smith’s experience, we will allow the case to be appealed as far as the legal process allows, knowing that Joseph’s own appeal to President Martin Van Buren of the United States was ignored. After Judge Naftz issues his final decision and order in this case, we will allow the disposition of the case to continue under our advisement, holding Christopher’s safety and his ability to finish our work of the utmost importance. Bennett, John C. (1842). History of the Saints; or, an Exposé of Joe Smith and Mormonism. Boston: Leland & Whiting. p. 218. As was reported, a year before his murder, Joseph Smith was speaking about “the pre-existence of our spirits, and our relations to God in the spirit world, and our standing in the family circle of our Father” when Joseph turned and told the LDS/Mormon Twelve Apostles that they would kill him if he told them the Real Truth about these things. Consistent with the directive and counsel under which Joseph operated, he “delivered unto the [early LDS/Mormons] many things which they [could not] understand, because they desired it.” Setting aside the simple words of Jesus as spoke in the Bible’s Sermon on the Mount, the early LDS/Mormon people wanted to know all of God’s mysteries … in full. “Because they desired it,” Joseph gave them the temple endowment presentation, which no LDS/Mormon understood then, nor does any fully understand today. Before Jean-Martin Charcot and Sigmund Freud visualized the concepts of modern psychology associated with human consciousness, Joseph Smith, Jr. explained it perfectly in symbolic religious terms that his followers could not understand. So, where did Charcot and Freud get their information? On what did these two modern psychologists base their unique understanding and information that would lead to a strategic paradigm of mental study that is very close to the Real Truth about “the pre-existence of our spirits, and our relations to God in the spirit world, and our standing in the family circle of our Father”? We have explained that wherever the possibility presents itself in the world when our knowledge and information of the Real Truth could be used to influence the thinking of the world’s most influential persons, we would make ourselves available and present our knowledge unobtrusively and incognito. The few who know of us realize that we hold an MWAW residence in France. In 1885, two of Charcot’s servants, both of Latino-American descent, found favor in their master’s eyes. Two of us came to know Charcot from our involvement for many years as low-class employees of the famous Pitié-Salpêtrière Hospital in Paris, France, where Charcot worked for many years. Needless to say, our presence indirectly influenced, first Charcot, then Freud. Curious about the two of us, who are of Inca descent, Jean-Martin Charcot would engage in conversations about the Aztec and Mayan civilizations that had developed in the Western Hemisphere. Inquiring of ancient Aztec and Mayan beliefs that had led to the amazing development of these two cultures, it was not difficult for us to introduce new concepts of Real Truth interpolated into the conversations we had with Charcot. Although our simple explanation of the three conscious states of human existence seemed mildly eccentric and delusional to the educated minds of Charcot and Freud, its implication profoundly affected their thinking, and eventually, their own presentation of human cognitive function. Before Charcot and Freud, Joseph Smith, Jr. could explain it perfectly. Elohim/God/Adam; our Actual True Self; our Superego; our unconscious mind. Jehovah/Christ/Eve; our New Advanced Self—the new person we become that is created in similitude of our Actual True Self. This new advanced person is created in our Actual True Self’s mind similar to how a mortal mind creates a dream person that is consciously participating in our mortal dreams—our Ego; our subconscious mind. Michael/Holy Ghost/Lucifer; our mortal self; our Id; our conscious mind. The illustration below is Freud’s division of these three levels of human consciousness and the estimated usage of each level. They are the conscious, subconscious, and unconscious. Working together they create our reality. Since consciousness is best understood as having an awareness of something or being able to call it to mind, it would seem simple enough to qualify only those events we can recall as the activities of the human mind. A review of the earlier illustration shows the unconscious, sitting a layer deeper in the mind under the subconscious. Although the subconscious and unconscious have direct links to each other and deal with similar things, the unconscious mind is really the cellar, the underground library if you like, of all your memories, habits, and behaviors. It is the storehouse of all your deep-seated emotions that have been programmed since birth. Freud’s psychoanalytic theory teaches that it is here, in the unconscious mind, that necessary change can occur through the use of psychoanalysis. LUCIFER: Eve, here is some of the fruit of that tree. It will make you wise. It is delicious to the taste, and very desirable. LUCIFER: I have said nothing about Father. I want you to eat of the fruit of the Tree of Knowledge of Good and Evil, that your eyes may be opened; for that is the way Father gained His knowledge. You must eat of this fruit so as to comprehend that everything has its opposite: good and evil, virtue and vice, light and darkness, health and sickness, pleasure and pain; and thus your eyes will be opened and you will have knowledge. LUCIFER: There. Now go and get Adam to partake. EVE: Do you not recollect remember that Father commanded us to multiply and replenish the earth? I have partaken of this fruit and by so doing shall be cast out, and you will be left a lone man in the Garden of Eden. ADAM: Eve, I see that this must be so. I will partake that man may be. ID: Ego, you’ve got to act on your mortal natural instincts. It will make you wise. It is delicious to the taste, and very desirable to act on these instincts. ID: I am a part of you. EGO: You, a part of me, and come here to persuade me to disobey what I know to be right? ID: I have said nothing about what is right or what is wrong. How do you know what is right for you and what is wrong for you? I want you to act on the desires of your body, your lust for life and the things that this world has to offer you that your eyes may be opened; for that is the only way that you are going to know if these things are actually good or bad for you. EGO: Is there no other way? ID: There is no other way that you can know if something is good or bad unless you have experienced the thing first. EVE: Then I will start acting on the human instincts and the desires of my physical body that is being enticed by this world. ID: There you go! Now go and live but do not let your conscience about what you think is right or wrong dissuade you from finding out for yourself. Forget about what is right or wrong for you, because you don’t really know. EGO: SUPEREGO(Conscience), although this might seem the wrong thing to do right now, I’m going to find out if it is right or wrong by doing it anyway. Because when I do, it is delicious to the taste and very desirable. SUPEREGO (Conscience): Ego, do you know what the consequences of this behavior … of acting on the desires of your body … will produce? EGO: Yes, it will tell me what actions are good for me and which are bad for me. SUPEREGO (Conscience): I cannot do these things. It just doesn’t feel right. EGO: Do you intend to do EVERYTHING that feels right, even when you don’t know the difference until you do it to know whether it is right or not? 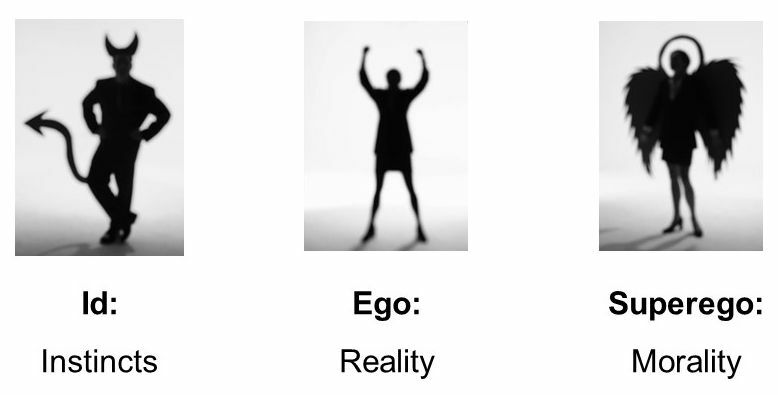 EGO: Do you not recollect that the reason why we even exist is because our True Self needs the mortal experience, and there is no way that we can have the mortal experience and learn what is right or wrong for our True Self unless we do this together. You supply the feeling of what you feel is the right thing to do, what our True Self wants from the experience, and I’ll act on our body’s natural desires to have the experience. Once I act, then you will be there to tell us if the act was good or bad for our True Self. SUPEREGO (Conscience): Ego, I see that this must be so. I will allow our mind to experience mortal life. One that is acted upon. There is only one that acts acts upon the other. A human is the ultimate compendium of matter that acts. Humans are the only kind of matter that acts. All other forms of matter, of any and all kinds, are acted upon by a human. Everything that you see in this world is a product of a human acting upon the matter that formed and is part of this earth. The very laws of nature are only doing what they do because a human acted upon them. We created the laws of nature to act as they do. We acted upon the laws of nature and made them to act according to our desires. A uranium-235 atom cannot and will not absorb a neutron from another atom and in the process release energy in the form of light and heat UNLESS A HUMAN ACTS to make the absorption happen. If atomic explosions acted naturally by the laws of nature, Earth would have exploded a long time ago. Over billions of years of existence, the earth has yet to create its own atomic explosion. The weather, the mountains, the seas, the rivers, the forests, everything that is observable to the human senses, and most importantly, agreeable, was and is created by humans. This is the GREAT REAL TRUTH that could change the course of humanity and the world. If man, in his great ignorance and lack of self-deprecation, can create enormous amounts of energy by acting upon an unseen atom and destroying it, man also has the potential to create any form of matter by the same rules of action. Humans have learned how to destroy atoms in order to destroy humans. If humans would consider human power, humans could learn to create atoms to create humans. Humans could learn to create atoms to serve humans. Humans could create a new earth and “multiply and replenish the earth” that humans may have joy and rejoicing in what humans produce to serve the needs of humans … the needs of one’s True Self. I will partake that man may be. Only this Real Truth can save this world. Only the commands of Elohim given to Jehovah and Michael can create from matter unorganized a world “like unto the other worlds that we have heretofore formed” for the benefit of our True Self … through the acts of mortal humans. ELOHIM: Jehovah, Michael, see—yonder is matter unorganized. Go ye down and organize it into a world like unto the other worlds that we have heretofore formed. These “other worlds” are and were formed in the mind of your True Self, for the sake of your True Self, and for YOUR particular True Self’s needs at each moment. You cannot remember your True Self anymore than your dream self can remember that you are dreaming until you awaken from the dream and realize that the experience you just participating in was only a dream. Our True Self’s mind is where all of our memories and past experiences reside. … It’s from these memories and experiences that our beliefs, habits, and behaviors are formed. The moment that our True Self begins the process of acting upon the atoms that make up the compendium of our True Self’s brain, we have a need that is personal. This need differs in all of us. We are finding out that the “beliefs, habits, and behaviors” that we each need individually are not the right thing … they do not produce the right fruit … they have given us a knowledge that what we need individually is evil in regards to this mortal earth experience with others that have their own needs … on an earth that we created … an earth that we corrupted because of our “beliefs, habits, and behaviors” … an earth that only we can save. We can save it by understanding the power and dominion that we have over it, and learning to control every atom of every piece of matter that exists. But since all of our individual needs are very different in each moment, we must create a world where all these needs can be met. Through this Marvelous and a Wonder®, which is the only true “work of the Father,” we can show you … we can teach you the Real Truth of who you actually are and help you understand the power that you have over the atoms that makeup this earth. We can help you to learn how to control them, how to create them, how to do anything that you want as long as it benefits everyone equally, so that each of our individual needs can be met. Joseph Smith knew because we taught him. Jean-Martin Charcot and Sigmund Freud began to understand because we taught them. Christopher knows because we taught him. You can learn what Joseph and Christopher knew[know] … what we know. You can learn in your own language, according to your own understanding. But you must first come to realize that your “beliefs, habits, and behaviors” are not supplying your True Self with what YOU need. They are not right. They are not good. They are evil. Your free agency to act has produced evil fruit on a tree that has the potential to produce good and evil fruit, or at least give you the knowledge of good and evil acts. Because all of us have equal power, none of us can act alone. We need each other because the process of experience (of a new life experience) we are forced to engage in, when our True Self’s brain needs the experience, is shared by many others who have their own needs. These others engage the process at the same moment that we do. This constitutes OUR GROUP of newly created advanced humans. “All things have been done in the wisdom of him who knoweth all things.